Lobar pneumonia is a lung infection that affects an entire lung lobe or a large and continuous part of it . When it affects more than one lobe, it is called multilobar, and when it affects all lung lobes, it is called panlobar pneumonia. Lobar pneumonia is most often caused by bacteria, such as Streptococcus pneumoniae or Haemophilus influenzae, but also by other bacteria, such as Klebsiella, Mycoplasma or Legionella, or viruses . Congestion in the first 24-48 hours with engorgement of the lung blood vessels and fluid in the air sacs (alveoli). Symptoms of lobar pneumonia usually develop suddenly and can include coughing up yellow, green or rusty mucus, shortness of breath, high fever, fatigue and chest pain during coughing. During percussion (tapping the chest with a finger), a doctor can hear a dull sound and during listening the lungs (auscultation), crackling sounds and decreased breathing sounds over the affected lung lobe. 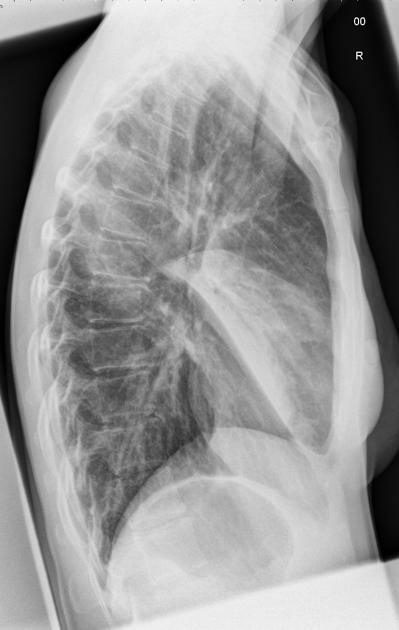 On an X-ray, lobar pneumonia appears as a continuous white patch in a lung lobe. NOTE: The pattern of lobar pneumonia on X-ray film does not already mean a bacterial cause. Treatment of lobar pneumonia depends on the cause — bacterial pneumonia is treated with antibiotics and viral pneumonia by antivirals. Lobar pneumonia affects an entire lung lobe, usually only in one part of the lung; an X-ray usually shows a single solid white patch (or two or more, if more lobes are affected). Bronchopneumonia affects small breathing ways (bronchioli) and small parts of the lung tissue around them (lobuli); an X-ray shows small white patches scattered over the large area of, usually both, lung wings.